The old capital of Vietnam was my first taste of this amazing country back in 2011, and it proved to be a great place to visit. I only spent four or five days in the former Saigon, but it was a great introduction to a country I was pretty excited about visiting for the first time. So yes, Ho Chi Minh City is a big city, it has its pollution issues (although nothing like Chinese cities), traffic can be a pain and it can be hard to navigate at times, but at the same time it’s full of friendly people, the guesthouses there were, well the one I stayed in was, welcoming and helpful, and it’s simply a great place to get into Vietnam. I found it warmer (not just the weather!) than Hanoi the capital where I flew out from. 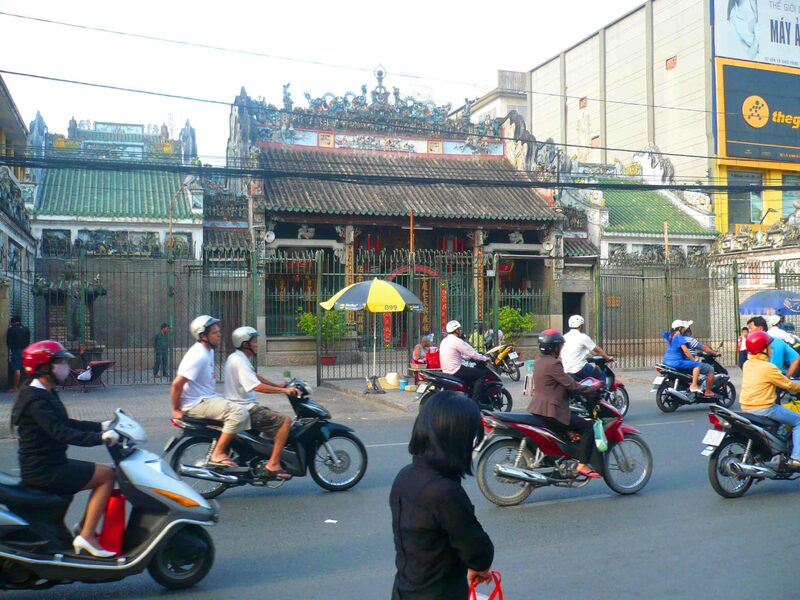 Not that I didn’t like Hanoi, but for me Ho Chi Minh City was the more enjoyable experience. Arriving at the airport it was a pretty easy customs experience. I already had my visa which definitely helped that process. 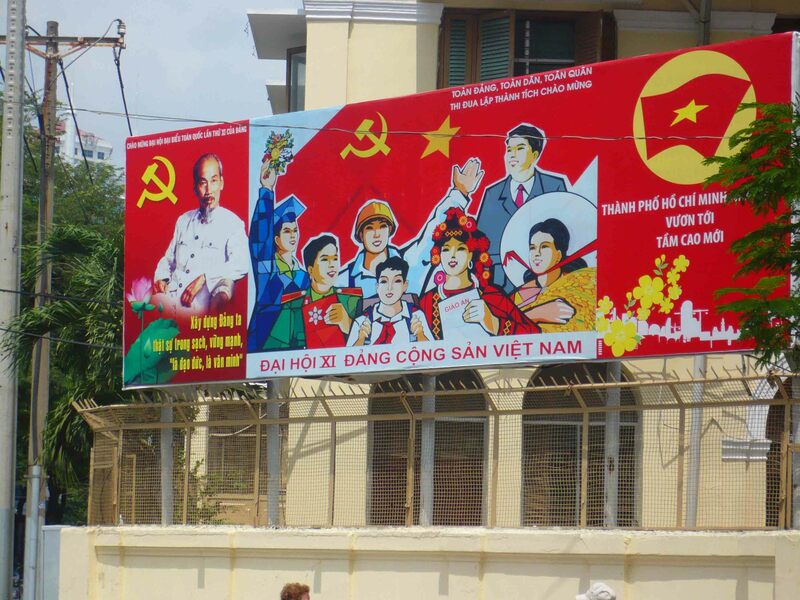 He still features in billboards – Ho Chi Minh. I caught a local bus into town, so not a lot of money forked out for that. On the bus I met a young tour guide and I was able to chat with her and determine the best place to get off the bus – so that I didn’t need to walk too far to the guesthouse/minihotel. The view from outside my hotel. I stayed at Madame Cuc’s 64 hotel. 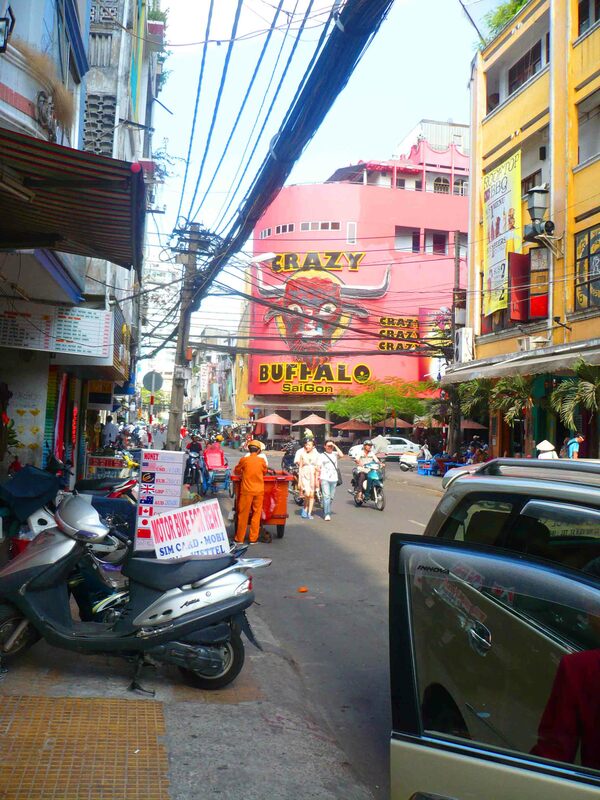 The location was pretty central, there was plenty of places to eat around there including places like the ‘Crazy Buffalo’ which seemed to be a bit of a night spot as well, and the staff were incredibly helpful and friendly. I was able to book onward tickets to Da Lat there and also to book my tour to the Cu Chi Tunnels. 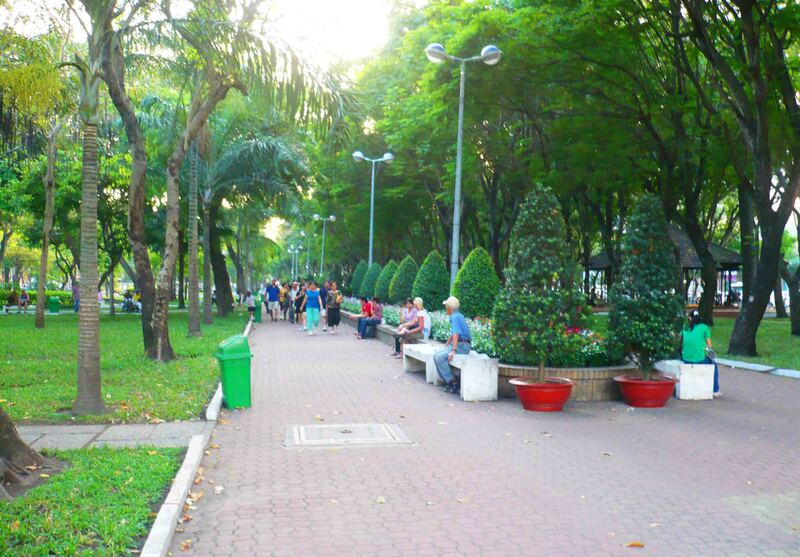 These are a must-see when in HCMC – tunnels used by the Viet Cong back in the war. In HCMC there’s plenty to see and do as well including a long list of temples and the War Remnants Museum, a bit of a propaganda-fest perhaps but also a solemn look at the war that engulfed the country and many others in the 60s and 70s. 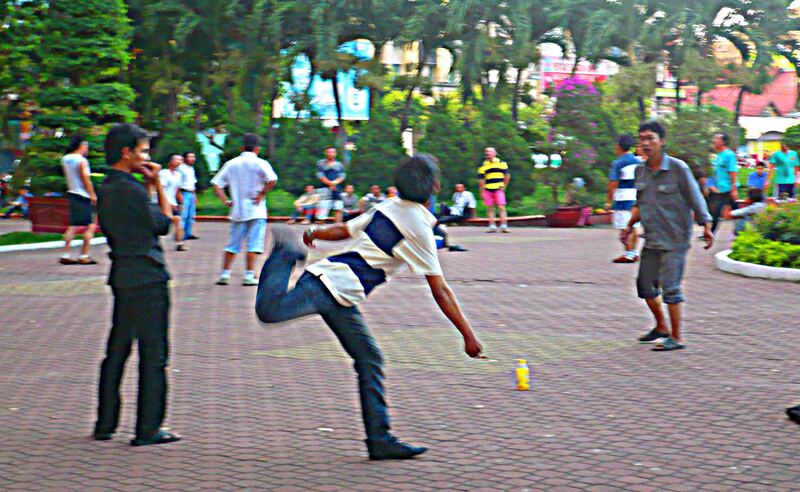 Hacky Sack in the park. However, the highlight was hanging out in the nearby park. Here there were loads of people hanging out and chatting in groups, and a bi of hacky-sack too. Here I met heaps of Vietnamese people keen to practice their English. I even went out with one group to karaoke which was a lot of fun. 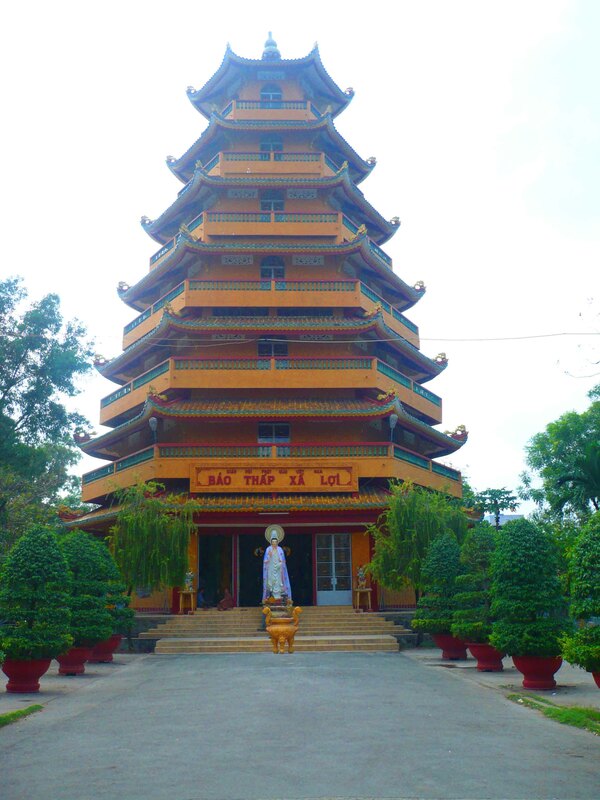 Seven storey pagoda? How’d you like them apples? 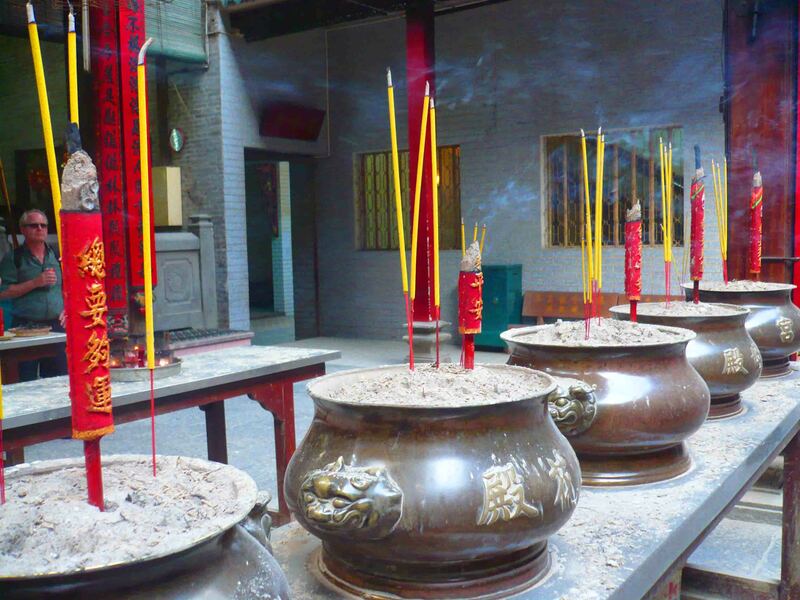 I took buses across the city to see different temples, walked all the way to historic post office which was quite a walk, and I think avoided taxis all together! So that goes to show it’s a pretty navigable place. It’s certainly a great place to watch the bikes – push and motor – as they make their way around the city. Of an evening I would sit out the front of the hotel and watch the world go by. Just down the road was a big intersection with the aforementioned ‘Crazy Buffalo’. All sorts walked down that street. I sat with other guests and we took it all in. Ho Chi Minh City agreed with me straight away. It was the PERFECT introduction to Vietnam. It’s also a brilliant city in its own right. Have you been? How did you find the place? May the Journey Never End! Fascinating! Oh I wish to visit it someday..
You must! Brilliant city – thanks for reading! Vietnam has been on my to-do list for too long. I’ve heard very mixed reports about the country, but everyone who likes it seems to be borderline IN LOVE with it! !